future.dj 1.2.1 – Mix audio, video and karaoke with ease. 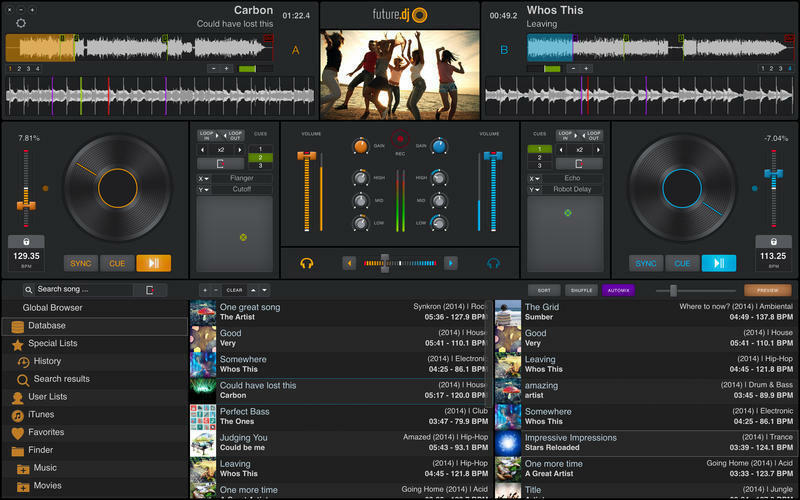 future.dj lets you mix audio, video, and karaoke. Mashup tracks, mix videos, and make song transitions with the greatest of ease with this classic DJ setup (2-decks and mixer). Thanks to its intuitive design and flexible features, you will be able to achieve any level of mixing complexity. You can also sit back and Automix an entire party, simply by activating the powerful Automix function. Perfectly in-sync tracks/beats You will find the automatic BPM detection very precise allowing you to instantly sync and change between the 2 decks. The smart-sync function guarantees that when you press the Sync button the deck will be in perfect sync with the other one. Visualize beats The waveform graphic display gives you real time audio signal monitoring, information about the audio signal and the beat rhythm. Each deck has 2 waveforms: a full song waveform and a zoomed-in waveform. Find your tracks with ease (includes iTunes library integration) There is a browser, a current-list and a side-list available for finding, organising and playing your tracks. You can instantly search for tracks, preview and pre-analyze them. Most file formats are supported for audio, video and karaoke. Create and recall loops, set up cue-points You can set up seamless loops instantly, by setting In and Out points. You can move the loop or make it shorter or longer on-the-fly. You can also set up to 3 instant cue-points (which act like bookmarks into the song). Scratch. Reverse. Brake. (works with videos too) You are free to make real turntable by using the waveform displays, as well as the virtual jogwheels. Depending on the speed of the drag and drop you can create a disk spin effect, scratch, reverse, play, brake, mute, fine-tune cue-points and even ‘reverse spin and play’ effect. Simple yet powerful mixer (includes effects) You can adjust the gain (amplification), equalizer (3 bands), apply and combine different effects (2 effects included, 7 more available as an in-app purchase). Next story Exposure X 1.1.0 – The creative photo editor that handles every step of your workflow. Previous story PhotoMill 1.3.3 – Multi-functional batch photo converter. Swinsian 1.12.0 – Music manager and player. djay Pro 1.2.1 – Transform your Mac into a full-fledged DJ system (was djay).